***** DISH OF THE WEEK (Sunday- 7/1/18- Pizza Bar). Real simple tale, outrageously delicious New York Style Pizza! ***** Pizza Bar, 1627 Collins Avenue, Miami Beach, Florida 33139, (305) 672-6880. For all you guys out there looking for off the chart delicious New York Style Pizza (thin crispy crust, sweet sauce, loads of gooey cheese, oil drip when the slice is pointed down) you gotta checkout- Pizza Bar in Miami Beach. Real simple concept at work there- order/pickup at the counter, humongous slices/ subs/ salads/ wings/ stromboli/ other stuff, counter seating, handful of tables inside/ outside, open Monday-Wednesday 11am-2am, Thursday 11am-3:59am. Menu/prices/info at pizzabar.com. Long story short, last night- Jeff Eats and Mrs. Jeff Eats tried this joint and it blew us away. 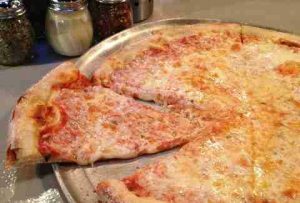 No bs- Pizza Bar’s pizza easily matched up against some of the best New York slices we’ve “enjoyed” over the past 60+ years in the 5- boroughs! Jeff Eats and Mrs. Jeff Eats also “did” a Greek salad and like the pizza it- was right on the money! 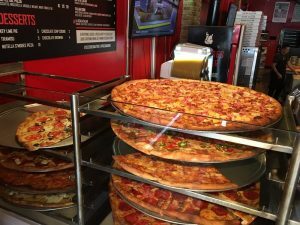 By the way, Pizza Bar’s wings and subs looked dynamite- so Jeff Eats is kinda thinking that Pizza Bar isn’t just a one trick pony- with the pizza! The next time Jeff Eats and Mrs. Jeff Eats are at Pizza Bar, we’ll do some wings and subs, so we’ll know for sure! Subs or no subs, wings or no wings- based on its pizza alone- Pizza Bar is an absolute must try!